How Far Can Your Robot Throw? 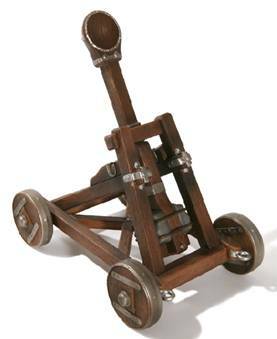 During medieval times, attacking armies used catapults like the one below to throw stones at castle walls, hoping to break them. 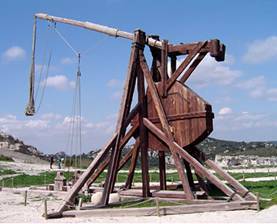 Some catapults had slings on the ends of the throwing arm; they were called trebuchets. They threw like this - sometimes they threw further than a catapult. 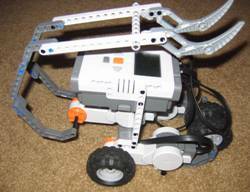 We will build these from our LEGO NXT MindStorms kits. 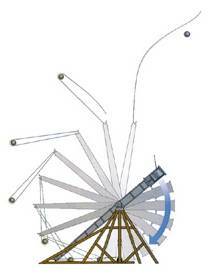 We can add some string or fishing line if we plan to build a trebuchet instead of a catapult. Believe it or not, there are standard rules for this type of contest! Some of the rules that are often used are listed below. The purpose: To throw your marshmallow as far as possible. The arena: A start line on any bit of floor that does not mind marshmallows being scattered over it. 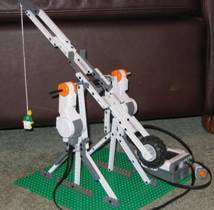 Making the robots: You can use bits from your MindStorms kit to build a robot powered only by LEGO motor(s) - plus about a metre of string or fishing line if you want to make a trebuchet instead of a catapult. The start of a bout: The robots will be placed behind the start line. During the contest: Once a marshmallow is launched, your machine must stop moving by itself. If your machine falls over during or after throwing your marshmallow, you will lose that contest. However since this is just for fun, you can use any of the rules above that you and your teacher like – you can even make up your own rules! To see some ideas from Mt. Nelson , click here (broadband), or click here (dialup) ; (there were restrictions on showing some of the students in the video, so the teacher demonstrated some of the catapults that were built during a 2-hour class session). Desperation – Out of Ideas? Mentor Note: This content is also available in printable 2-page Word 2003 format; click here.